Samsung has instituted a temporary sale for its Galaxy Tab 10.1 in Canada to boost sales while Singapore carrier M1 is now officially carrying camera-less iPhone 4 and iPhone 4S models following a premature launch earlier in January. South Korean electronics manufacturer Samsung has dropped the price of its Galaxy Tab 10.1 product line in Canada after recently introducing a 32 GB model, reports tech blog techvibes. 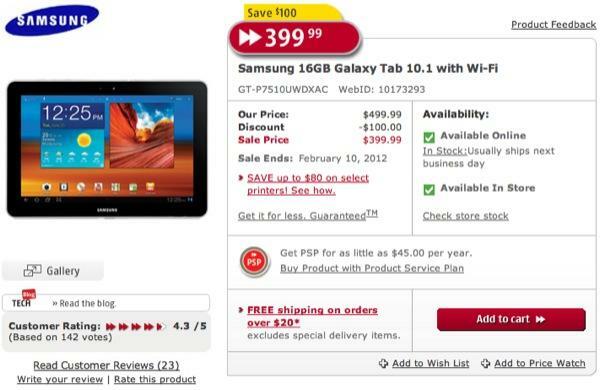 The online stores of Future Shop and Best Buy Canada reflect the new pricing scheme that undercuts the cost of Apple's iPad, with the 32 GB Galaxy Tab coming in at $499CDN, which was the original price of the 16 GB model that now sells for $399CDN. In contrast to Samsung's new temporary cost structure, Apple's entry-level 16 GB iPad 2 with Wi-Fi starts at $519CDN. According to the Future Shop website, the sale will end on Feb. 10, 2012. Following rumors and a premature launch, Singapore wireless carrier M1 is now officially carrying "Non Camera" iPhone 4 and iPhone 4S models for servicemen who cannot bring camera-equipped phones onto military installations. The modifications completely remove both front and rear camera sensors, which apparently "may not be reinstalled." It is unclear what exactly is done to ensure that the device can't be returned to its original state. Despite having a crippled feature set, the smartphone carried a premium of about $38 due to labor costs for the modifications. 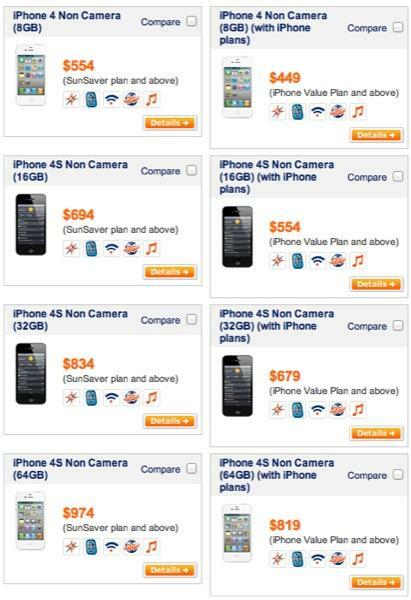 Prices start at $352 for an 8 GB iPhone 4 and top out at $765 for a 64 GB iPhone 4S when purchased with a two-year smartphone plan. According to CNET, the camera removal procedure was approved by Singapore's Ministry of Defense, and each phone will come with a document denoting its certification. As Apple stipulates that any sort of modification will void the iPhone's warranty, M1 is offering a one-year third-party option for an additional $252.